When music fans think about the bands who were contemporaries of The Isley Brothers, most are likely to recall the names of groups such as Earth, Wind & Fire, the P-Funk Family, Sly & The Family Stone and others bands whose fertile creative periods occurred in the 1970s and early 1980s. In fact, when most people think of The Isley Brothers, they are likely recalling the sextet that created a series of great albums in a ten year period that began in 1973 with 3+3 and ended in 1983 with Between The Sheets. Some might be inclined to include the Isley Jasper Isley 1985 classic Caravan of Love. 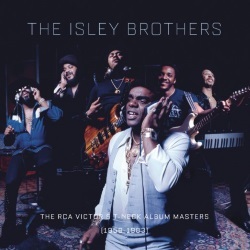 However, one thing that becomes clear to anyone who makes an investment in Legacy Recordings’ magisterial box set The RCA & T-Neck Album Masters (1959-1983): Failing to consider the material that the Isleys released as the trio of O’Kelly, Rudolph and Ronald between 1959’s Shout and 1973’s The Isleys Live is to have an incomplete picture of how The Isleys Brothers became those Isley Brothers. Those first nine projects show a band constantly refining its sound by drawing not only from their musical contemporaries in the 1960s and early 70s, but also what was taking place culturally and politically and what came from their background as the children and grandchildren of musicians in the Baptist church and the Vaudeville circuit. You really cannot understand Ernie Isley’s rock and blues guitar playing, which fused Jimi Hendrix with Muddy Waters, without the realization that Jimi Hendrix – performing under the name Jimmy Jones – played guitar for the Isleys for a time in the 1960s. So Hendrix’s influence was firmly implanted by the time Ernie switched to the guitar and began adding his signature guitar solo sound tracks such as “Who’s That Lady,” on the 3+3 album. The 1964 work, captured on the album In the Beginning…The Isley Brothers & Jimi Hendrix, was ultimately released in 1971 – the year after Hendrix died. It reveals that Hendrix was also experimenting and refining that sound that would make him a guitar hero by the end of the 1960s. Listen to Hendrix cut loose on the instrumental version of “Move Over Let Me Dance, Part II,” and you will hear the blues influences that Hendrix employed throughout his career as a leader. In The Beginning allows listeners to hear the band in the early phase of seeking its place in the music market by going through process of drawing on their more famous (at the time) contemporaries. So Ronald vocally channels Ray Charles on “Wild Little Tiger,” while the musical and backing vocal arrangements on “Simon Says” has a Four Seasons Feel. “Looking For A Love” fuses the wall of sound feel of Little Anthony with the vocal soulfulness of The Impressions. It’s at this point where the group begins earnestly refining the signature Isley sound that features deep funk layered around Ronald’s buttery tenor. Amazingly they managed to congeal largely under the radar as they made wonderful musical choices that no mainstream group would be able to make today. Those choices include Givin’ It Back, an album of covers of everything from a version of Eric Burdon and War’s “Spill The Wine” that matches the original in its loopiness, as well as a cover of the Crosby, Stills, Nash & Young Vietnam War protest song “OHIO,” which is about the Kent State massacre that took place during a student protest of the military’s invasion of Cambodia in 1970. Those wondering about the band’s sense of social awareness that became apparent on tracks such as “Fight The Power” and “Harvest For the World,” can get some insight by listening to “OHIO.” The fact is, it must have been an honor for artists such as James Taylor or Carole King to have The Isley Brothers cover one of their songs because they not only managed to reimagine the folk rock and 1970s era acoustic singer/songwriter tunes as soul and funk masterpieces, they also made a boatload of money for artists such as Stephen Stills and Todd Rundgren by transforming classics such as “Love the One You’re With” and “Hello It’s Me” into tracks that still get played regularly on R&B radio 40 plus years later. Of course, the meat of the collection focuses on the now classic Isley releases from their commercial heyday of the 70s and early 80s, after the infusion of fresh ideas and fantastic musicianship that came with the additions of Ernie Isley, Marvin Isley and Chris Jasper. The music from that rich period still sounds surprisingly fresh decades later, and listening to the remastered versions popping from the speakers reminds us of why this group attained the Hall of Fame revered status it enjoys with both music historians and millions of fans. The box set itself contains 21 digitally remastered CDs packaged in sleeves that contain the original artwork. The CDs feature the distinctive T-Neck logo featured on those classic albums and 45s. Many of the CDs include bonus tracks such as radio, mono an instrumental versions of famous tracks. The glossy booklet included in the box set lists all the tracks and bonus tracks, as well as a short history of each album that provides wonderful details that longtime Isley fans (and those younger fans who mainly know Ronald Isley as Mr. Biggs) will enjoy reading. And while some may lament the absence of the group’s Motown material, that necessary and understandable omission will recede from memory through the sensory overload of great music that The Isley Brothers still managed to record over a quarter of a century that elapsed between the late 1950s and the early 1980s. This is a collection the hefty physical size of which is happily exceeded by the decades of musical brilliance included inside. Highly Recommended.